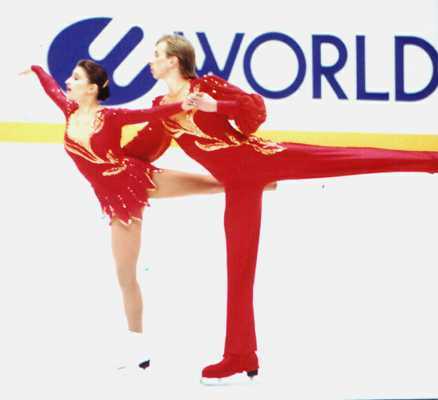 Oksana Kazakova and Artur Dmitriev have been skating together since early 1995. In that short time, they've already won over fans and judges. They just achieved the crowning glory of their career by taking home the 1998 Olympic Gold medal. 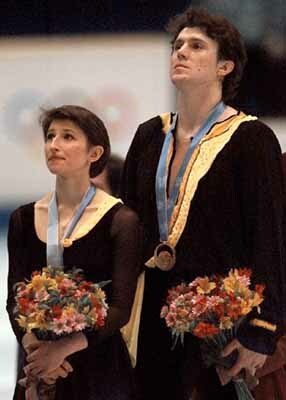 Artur Dmitriev is the 1992 Olympic Champion with his former partner Natalia Mishkutenok. They amicably agreed to end their partnership in the fall of 1994, following their Olympic silver medal at Lillehammer and their win at that summer's Goodwill Games. Artur and his coach, the renowned Tamara Moskvina then selected Oksana Kazakova to continue their tradition of success. Oksana had previously skated with Dmitri Sukhanov. She has been skating pairs since 1993 and prior to that was a singles skater. The rapid progress Oksana and Artur have made is incredible, especially when you consider that they have successfully competed against pairs who have been together many years longer than they have. Their lyrical artistry and intricate choreography are especially notable. site owned by Marianne Merola. Please send any comments about this web page to its creator: Marianne Merola. I would like to thank Andrei Karassev, Ed Wilson, and Ann Venezia for their invaluable help with setting this page up. Copyright 1997 by Marianne Merola. No items appearing on this suite of pages may be used without prior written consent.